One of my favourite cook books from last year was Sumayya Usmani’s brilliant Summers Under the Tamarind Tree, an intoxicating collection of Pakistani food. I’ve cooked from it ever since, and my copy is stuffed with bookmarks to remind me what to do next. 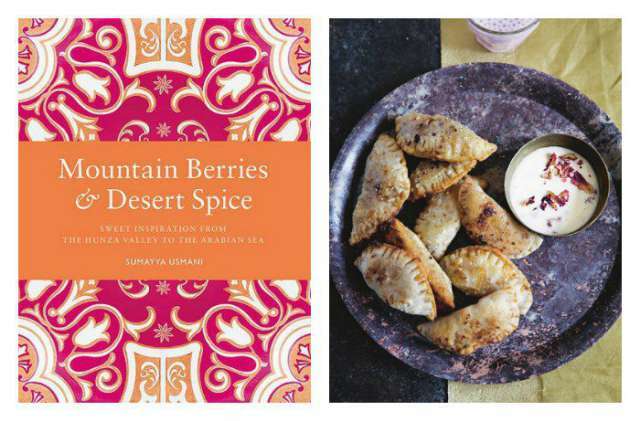 Usmani’s new book, Mountain Berries and Desert Spice is its equal, showcasing the sweeter side of Pakistani cuisine. Yes, I’m a fan, but not an immediate one. Now, a full disclosure. I’m not a big dessert person. I often sit that course out entirely, and if I’m forced, there’s always cheese, or maybe whatever’s available without too much cream on it (in it, as an ingredient, is fine. On it is not). I’ll bake the odd cake now and then, and biscuits too, and I’ve been known to do the occasional sweet loaf, but dessert just isn’t my thing. So, how am I going to square that with a real admiration for Mountain Berries and Desert Spice? Well, firstly, it’s a stunning book. It looks and feels substantial. The photography is beautiful and the styling evocative. The writing is fluid and the recipes are easy to follow, and tempting. It’s clear that Usmani has a real passion for her food. It just shines through the page. This in itself is enough. I can appreciate and admire this book on those grounds alone, but over and above that, it made me want to cook. There are some seventy or so recipes in Mountain Berries and Desert Spice, mainly Pakistani canon with little twists and modernisations here and there. It’s a collection rooted in place and history, given a refresh and overhaul. I like that. It means that there’s solidity there, some sense of tradition, something that’s been built on. Most of all, this is a book that I’ve started to bookmark already. “Yeah, going to try that. And that. And that….”. There are plenty of things that caught my eye … a Peshwari pistachio ice cream, a delicate pale yellow gelato with the soft taste of pistachio, gajar ka halva, a traditional carrot halva, slow cooked with cloves and saffron, meva naan, a slipper shaped bread topped with sugar, seeds, spices and dried fruit. Sweet parathas stuffed with date, walnut and milk fudge, a fruit chaat of guava, pomegranate and mango, little malpuri semolina pancakes with a raspberry and pomegranate sauce. Mountain Berries and Desert Spice might have a slightly over the top name, but it’s a superb collection of excellent recipes, presented beautifully and with real love. A great introduction to sweet Pakistani food.